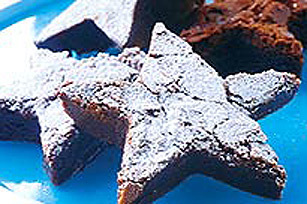 Have some festive fun with your brownie baking. Cut these decadent chocolate brownies into holiday shapes using on-hand cookie cutters for a simple twist. Preheat oven to 350°F. Microwave chocolate and butter in large microwavable bowl on MEDIUM 2 minutes or until butter is melted; stir until chocolate is completely melted. Add granulated sugar, eggs and vanilla; stir until well blended. Add flour; mix well. Spread into greased 13x9-inch baking pan. Bake 30 to 35 minutes or until toothpick inserted in centre comes out with fudgy crumbs. (Do not overbake.) Cool in pan. Cut into 24 brownies using holiday cookie cutters. Garnish with icing sugar just before serving, if desired. This is an indulgent recipe to enjoy on special occasions.